Without a doubt, the most closely watched item of the 2011 proxy season has been the two shareholder advisory votes required by the Dodd-Frank Wall Street Reform and Consumer Protection Act – the non-binding advisory vote on the executive compensation program (the so-called “Say-on-Pay Vote”) and the non-binding advisory vote on the preferred frequency (one, two, or three years) of future Say-on-Pay Votes (the so-called “Frequency Vote”). This proxy season, Compensia has monitored the Say-on-Pay Vote and Frequency Vote results for the 150 largest high-technology and life sciences companies headquartered in the San Francisco Bay Area (primarily in Silicon Valley), which we call the Bay Area 150. This Thoughtful Pay Alert summarizes our findings from these results as of July 8, 2011, based on the Exchange Act reports of these companies as filed with the Securities and Exchange Commission. As of July 8, 2011, 91 of the 150 companies in the Bay Area 150 (61%) had held their 2011 annual meeting of shareholders and reported the voting results from those meetings. Of this group of companies, only three – Hewlett-Packard Company, Intersil Corporation, and Monolithic Power Systems, Inc. – failed to receive majority support for their Say-on-Pay proposal. At HP, the vote was 48% for the proposal and 52% against the proposal; at Intersil, the vote was 44% for and 56% against, and at Monolithic Power Systems, the vote was 36% for and 64% against. So far, this 3% failure rate is slightly higher than the results of the broader corporate community where 40 companies (out of the 2,547 companies that, to date, have reported the results of their annual meeting of shareholders), or 2%, have reported that they have failed to obtain majority support for their Say-on-Pay proposals. In each instance where a Bay Area 150 company failed to garner majority support for its Say-on-Pay proposal, the proxy advisory firm Institutional Shareholder Services, Inc. (“ISS”) had issued a recommendation to its clients to vote “against” the proposal. Two of these “against” recommendations were predicated largely on a perceived pay-for-performance “disconnect,” while at HP the unfavorable recommendation was based, in part, on a controversial compensation package awarded to the company’s new chief executive officer and, in part, on shareholder displeasure with the prior pay decisions of the company’s board of directors. On the other hand, an “against” recommendation from ISS was not necessarily fatal. To date, 13 companies in the Bay Area 150 have received an unfavorable recommendation on their Say-on-Pay proposal, and 10 have been able to muster sufficient support to record a passing vote, including one company (Rambus) which saw 86% of the votes cast in support its executive compensation program. 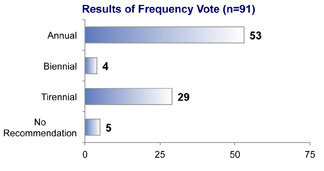 Among the 88 companies where a majority of shareholders voted in favor of the Say-on-Pay proposal, 60 of them saw more than 90% of the votes cast on the proposal cast in favor of the executive compensation program, including 16 with more than 99% support. 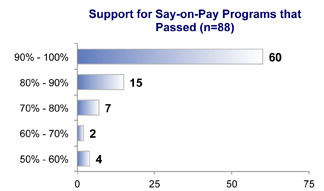 Average support for the Say-on-Pay proposal at these 88 companies was 89%. At the same time, six companies saw at least 30% of the votes cast on the Say-on-Pay proposal voted against the executive compensation program, signaling that these companies have some work to do with their shareholders before next year’s vote. These were Adobe Systems, Affymax, Electronics for Imaging, NVIDIA, SunPower, and Yahoo! Of the 91 companies in the Bay Area 150 that had held their annual meeting of shareholders as of July 8, 2011, nearly 60% (53 companies) recommended that future Say-on-Pay votes be held every year. Another 32% (29 companies) recommended that future Say-on-Pay votes be held every three years. 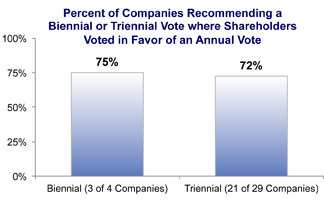 These figures vary somewhat from the broader corporate community, where only 51% of companies have recommended an annual Say-on-Pay vote and 43% have recommended a triennial vote. As in the broader corporate community, shareholders have demonstrated overwhelming support for annual Say-on-Pay vote. At 52 of the 53 companies recommending an annual Say-on-Pay Vote, the majority of the votes cast by shareholders agreed with the company’s recommendation. At one company, Trident Microsystems, Inc., 76% of the votes cast expressed a preference for future Say-on-Pay Votes to be held every three years, in spite of the company’s recommendation that such votes be held annually. Trident has yet to publicly disclose the decision of its board of directors on future Say-on-Pay votes. This support for annual Say-on-Pay Votes extended to the companies where a periodic vote had been recommended, with shareholders at three of the four companies where a biennial vote was recommended expressing a preference for an annual Say-on-Pay Vote and shareholders at 21 of the 29 companies where a triennial vote was recommended also voting in favor of holding future Say-on-Pay Votes every year. While only 12 of these companies have subsequently announced that, consistent with their shareholders’ wishes, they intend to hold a Say-on-Pay Vote every year, we expect most of the remaining companies to do so in the months ahead. In addition, at each of the five companies which chose not to make a recommendation on the frequency of future Say-on-Pay Votes, shareholders expressed a preference for an annual advisory vote on the company’s executive compensation program. Although shareholders of the Bay Area 150 companies generally have been supportive of the executive compensation policies and practices of their respective company, it is still important for these companies to maintain lines of communication with their major investors and to ensure that they understand how their pay programs align with the corporate governance policies of their major institutional investors and the proxy advisory firms. 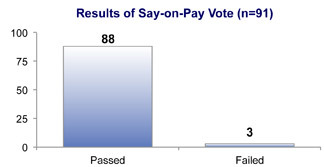 Even though, as a non-binding vote, Say-on-Pay is simply a “messaging” tool, in today’s volatile environment a company that loses its focus on compensation matters can quickly go from seemingly “safe” status to one where a large number of “against” votes on Say-on-Pay can trigger reputational damage and make the company a potential target for shareholder derivative litigation. Compensia has extensive experience in helping companies draft the executive compensation disclosure in the proxy materials for their annual meetings of shareholders and analyze the potential impact on the Dodd-Frank Act shareholder advisory votes on their executive compensation programs. If you would like assistance in preparing your executive compensation disclosure for the new required shareholder advisory vote on executive compensation, or if you have any questions on the subjects addressed in this Thoughtful Pay Alert, please feel free to contact Mark A. Borges.